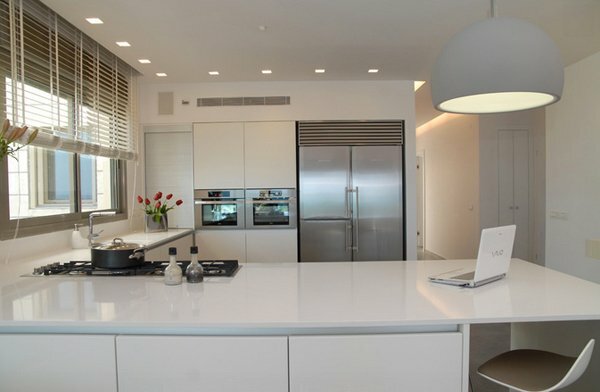 The way we light our kitchen affects the functionality of the space and how we feel when we’re spending time there. 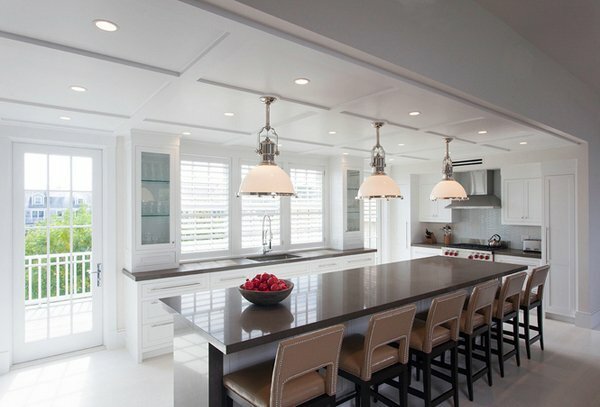 Despite this, lighting is often an afterthought in a kitchen remodeling project – the last detail after the cabinets, the appliances, the tile, and the granite countertops. So it’s no wonder that there’s often a sliver of the budget left for this critical element. 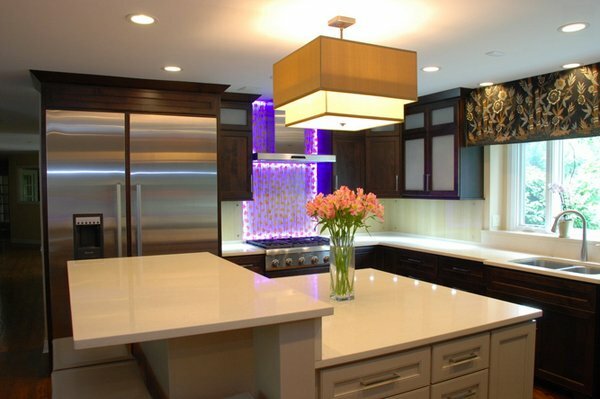 Most often than not, we need task lighting in the kitchen unlike in some other spaces in the house that we can use accent or decorative lighting. We all know that task lighting is the illumination of work spaces, like the countertops because we do the preparation there. So, today let us go ahead and check the 15 Pretty Kitchen Ceiling Lighting below. This exhibit floating ceilings, under counter lighting, cove lighting into the family room and square pinholes in the dropped wood ceiling. Decorative pendants round out the design by providing a decorative accent to the kitchen. 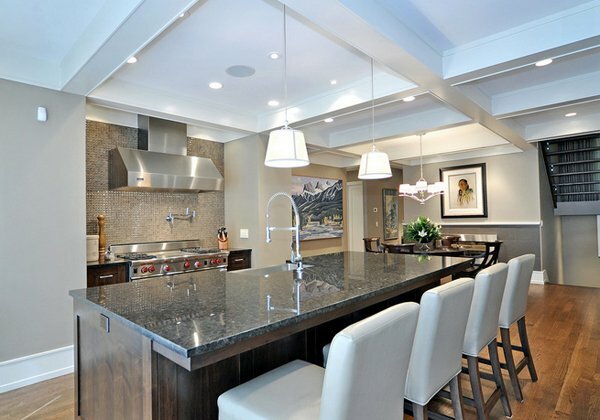 This contemporary Calgary kitchen has wonderful pendants falling gracefully from the ceiling. 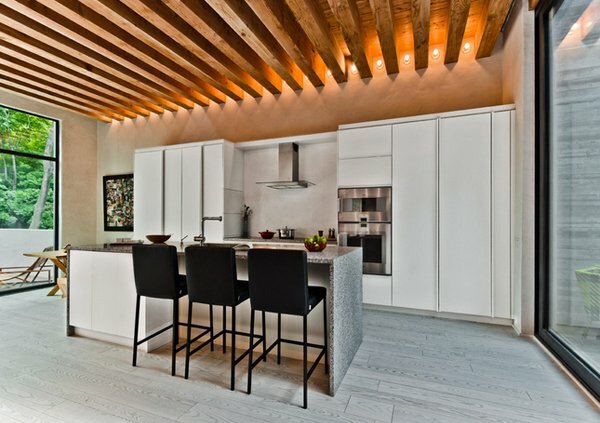 Aside from complementing the ceiling and the kitchen counter, these pendants are truly stunning. 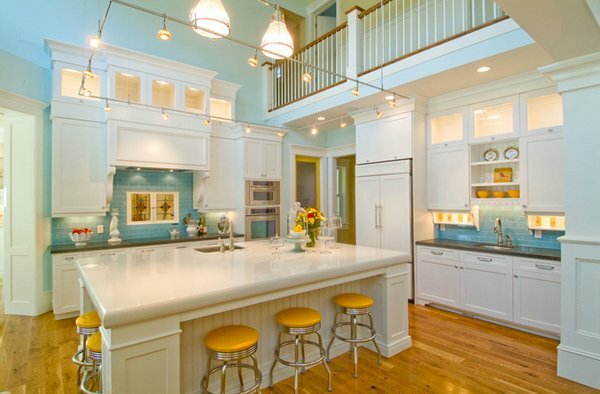 The kitchen layout is fabulous even when it looks a bit traditional. Adding industrialized pendant lighting to this space took the design for it to becoming a higher being! Totally stunning! The kitchen was completely remodeled and outfitted with efficient high-end appliances. Backsplash tile from Heath Ceramics adds to the home’s unique color palette. DeLisle decided to choose brisk and bold colors such as Prussian blue, grass green and pink, combined with more earthy tones such as terracotta, gold and sand. 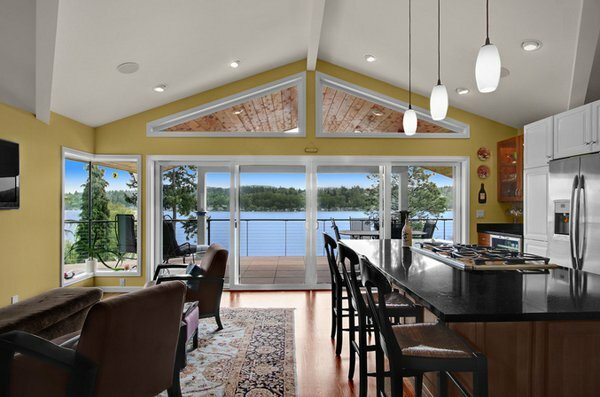 The designer said that they removed and lifted the ceiling replacing it with a gabled, exposed beam ceiling, extending it over the new deck. Installing seamless corner windows and post-less sliding doors create a light filled open space environment. Speaking of showing off that wine refrigerator, another option is to place it to face out into the space adjacent to the kitchen. The glass nook above the counter is definitely stunning just like the unique lighting present in this kitchen. We love the combination of the colors in this kitchen space. The yellows complement and blend well with the whites and the blues seen here. The lighting is a bit industrial which made this traditional kitchen a bit more fun and bright. Allied cabinets did a great job in the cabinetry works for this kitchen and the furniture used for the stools are fascinating too. The lighting is a bit contemporary-industrial which completes the look for this space; a bit like a conversational piece and sure is functional. Oversize pendant lights scare a lot of people. But there is no reason overhead pendant lamps have to be teeny tiny. Going oversize makes a huge impact and can really liven up an otherwise plain room. Bamboo is a rapidly renewable resource, and it’s naturally stronger and harder than most other hardwoods. 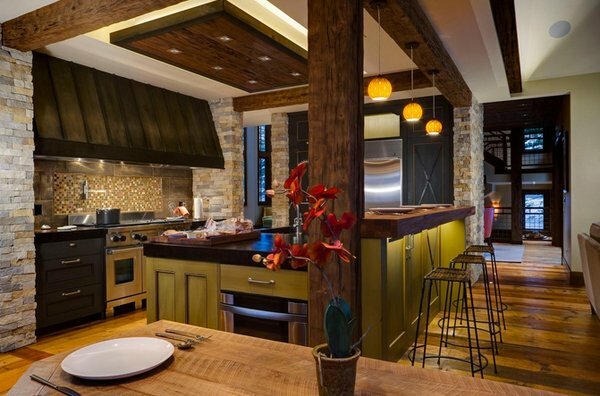 In this kitchen, Plyboo, an FSC-certified bamboo product, is set in a darker wood frame for an exotic look. Notice the lighting which contrasts all the colors of its surroundings and still stand out. 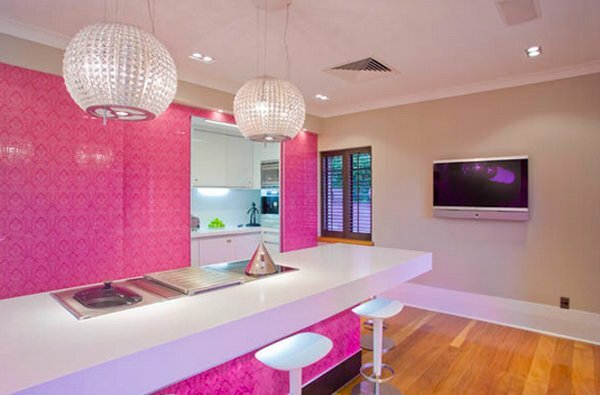 Here is another take on pink kitchens from Mal Corboy. This space is definitely shouting feminine but the whites are toning it down a bit which might still work for men – we guessing on that. This is an arrangement seen more frequently in modern and contemporary kitchens. It’s possible that your cabinet company may offer a single-oven tall cabinet. And did you notice the single balloon pendant light? Definitely stunning. We also got a tip from an expert, Randall Whitehead, he said that you should plan on setting aside about 10 percent of your budget for lighting. Five percent of that goes toward fixtures, while the other 5 percent is for installation. This information should really be considered since lighting is as important as the chairs we buy for our kitchens! Anyways, if you want see more on lighting here on Home Design Lover, check out 15 Modern and Stylish Pendant Light Designs, and tell us what you think about the 15 Pretty Kitchen Ceiling Lighting. Ecologia Montreal has the unique style of ceiling lightning for the kitchen. 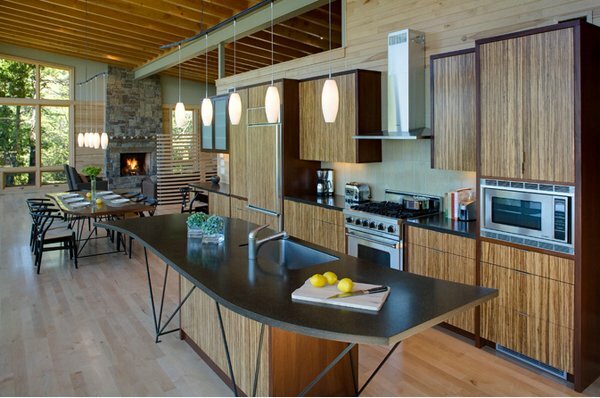 Great designs for a kitchen and if I could have my own house I want to choose the Portola Valley design for my kitchen. Amazing styles and some of them looks like an office room.Cool!! I love the pink kitchen it’s so lovely and attractive…. 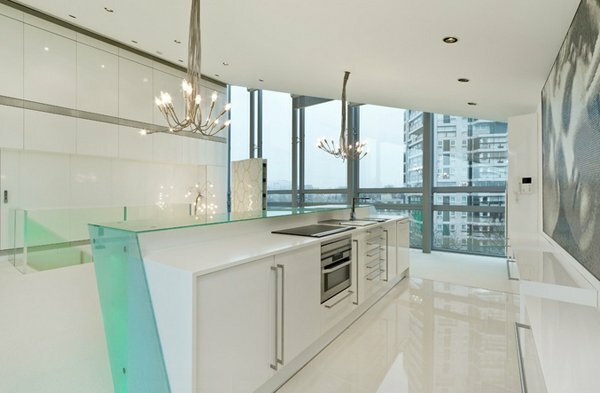 Beautiful Kitchen,it is important to consider the source of light in the kitchen. 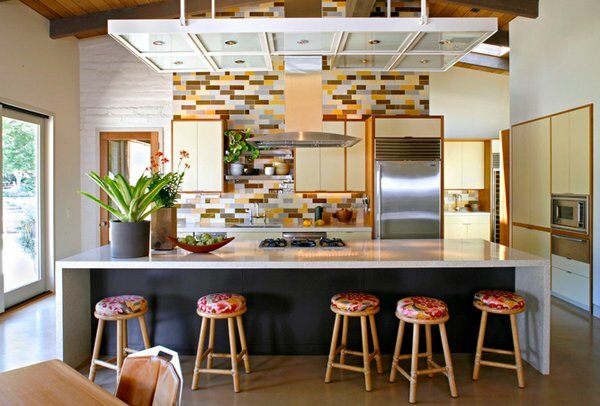 Putting some plants/flowers can add a refreshing look for kitchens like the Portola Valley. I love to cook so I want a kitchen that aside from being attractive it must also have a enough space to move freely..